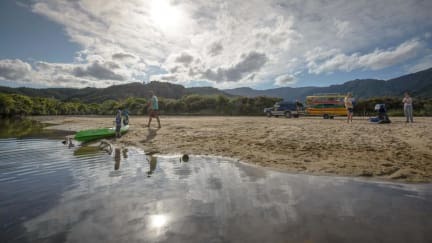 You will have a great range of accommodation options to suit you including private cabins, modern clean dorms or spectacular camping site (power and non powered). The Barn is ready to provide everything for you to come and enjoy onsite with large outdoor decking, multiple BBQ areas, great sea views of the islands, plenty of seating and a great range of modern accommodation oceans. Even the showers have sea views! We also have movie and reading rooms so there is space to unwind. We also aim to help you make the best decisions about things to do in the area. We organise water taxis, kayaking, sailing trips into the park as well as guided walking tours, seal/penguin watching, canyoning, caving, sky diving, hand gliding, microlight flight and more. We will organise transport for you, so you can be picked up from The Barn!